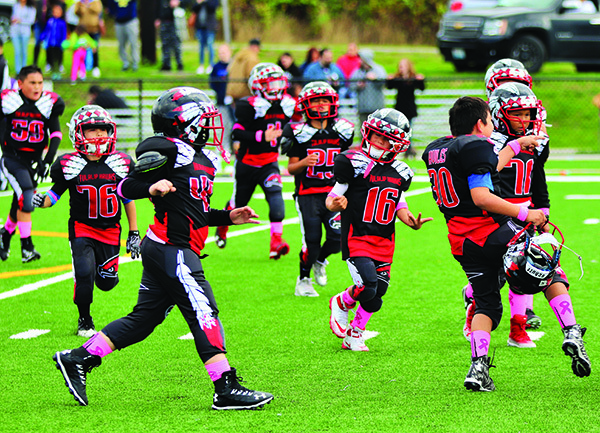 The North Sound Junior Football League is the most competitive and officially coordinated league in the area for youth eager to showcase their skills on the gridiron. This season North Sound welcomed five new teams into the league; Pee-Wees, 89ers, Juniors, Bantam, and Seniors all proudly represented the Tulalip Hawks program over the last several months. The Bantam (12-u) team, coached by tribal member James Madison, separated themselves from all other teams thanks in part to an explosive offensive and lockdown defense. 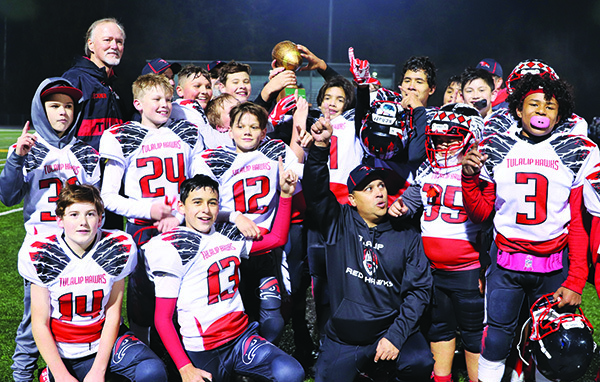 Loaded with talented, young Tulalip athletes, the Junior Hawks Bantam squad had Championship or bust expectations from the get-go. With lofty expectations, this group of youngsters played at a championship level by steam-rolling their competition week after week. During the regular season, they routinely exploited defenses with their overpowering running game, while stifling their opponents’ best players. Producing blowout victory after blowout victory, these Junior Hawks outshined everyone in the Bantam division. Going into the postseason they averaged 40.8 points on offense, while giving up just 5.1 points on defense. That whopping margin of victory increased after a 50-0 victory in their 1st round playoff game, followed by a 40-0 win in the semi-finals. The pair of playoff Ws setup the North Sound championship game between the Tulalip Hawks vs. Lynnwood Royals on Saturday, November 10 at Arlington High School. The kick-off temperature was around 40 degrees, which made the 200+ fans in the stands layer up with winter coats and blankets galore. But on the field, the boys’ blood was running hot with excitement knowing they were just one more victory away from reaching their championship goal. In the opening quarter, Tulalip scored first when running back Gio Hernandez took a direct snap from center and scored on a 25-yard run. Lynnwood quickly countered with a score of their own, which Tulalip then topped with another Gio touchdown, this time off a 38-yard run and score. Lynnwood again matched the Junior Hawks with a running touchdown of their own, marking the first time since their first game of the season that Tulalip gave up multiple scores to their opponent. It was obvious that Lynnwood had brought their A-game and Tulalip would have to take their play to another level in order to win. Midway through the 2nd quarter, running back Gaylan Gray added to his highlight reel with 37-yard touchdown run that included a sweet spin-move to break a tackle. The touchdown put Tulalip up 19-13 going into halftime. To start the 2nd half, Tulalip coaches watched from the sidelines as Lynnwood was again moving the ball well against their defense. The Royals tied the game at 19-19 after a punch in from the 1-yard line. The game tightened up from that point, with both teams’ defenses coming up with multiple 4th down stops. The score remained 19-19 for the remainder of the 3rd quarter and most of the 4th. With only minutes left in the title game, Tulalip marched down the field with an impressive drive. Lynnwood’s defense finally buckled when running back Gaylan took a 14-yard hand off to the left sideline, broke two tackles and dove towards pay dirt. His touchdown put Tulalip up 26-19 with three minutes left to play. 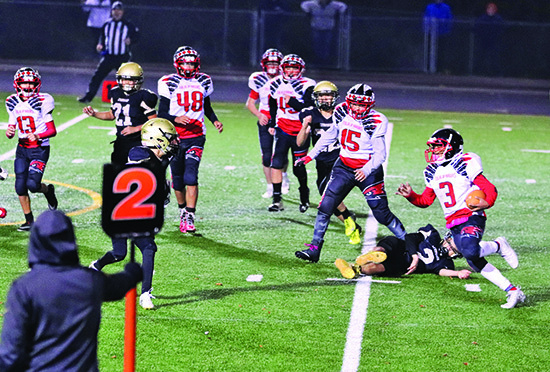 The Junior Hawks defense came up huge on Lynnwood’s subsequent drive when they forced a fumble and several Tulalip defenders jumped on the loose ball. With the ball back in the hands of their explosive offense, the Junior Hawks iced the game with another direct snap to their running back. Once again it was to Gaylan who followed his blockers up the right sideline for a 29-yard score. With a mighty 32-19 advantage and just two minutes remaining the game was all but over. 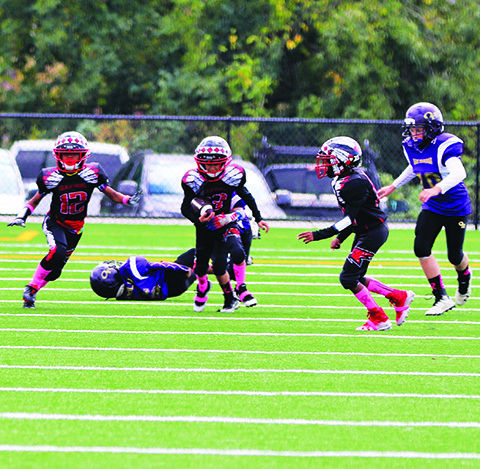 Moments later, a pair of quarterback sacks by Gio and Ryelon Zackuse sealed the Junior Hawks victory. Tulalip had achieved their preseason goal and was crowned North Sound division Champions! Looking forward, the Champions from Tulalip will be playing in a Northwest Regionals tournament Thanksgiving weekend. That will be their final test before they travel to Canton, Ohio where they’ve been invited to play in the Pro Football Hall of Fame’s World Youth Championship. This is a once in a lifetime experience for these boys who are making memories they’ll never forget. 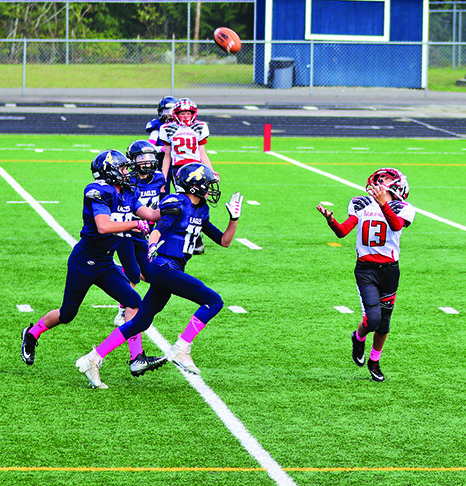 We’re midway through the North Sound Junior Football season, and two Tulalip Junior Hawks teams are garnering state-wide attention. The latest update to the Western Washington Junior Football power rankings have the fourth-grade level 89ers (4-1) ranked 8th in state, while the seventh-grade level Bantams (5-0) are all the way up to 4th. Both teams excellent play on the field and growing hype, as far as championship expectations go, has led to extra attention from opposing coaching staffs. It’s often the case lately that coaching staffs of soon-to-be opponents are coming out to video record the Junior Hawks’ games in order to scout formations and particular players. It’s respect of the highest honor really; youth football teams playing so well that extra time and attention is being given to them like a high school or college program. 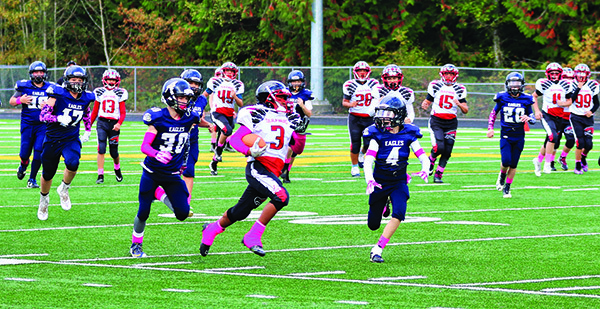 On Saturday, October 6, the Tulalip 89ers hosted Oak Harbor in a week six matchup. Coming into this game, the 89ers defense has been tremendous. In fact, they’ve only allowed one team to score all season. That level of defensive play would continue and overwhelm Oak Harbor. The 89er defense was relentless, putting a lock on Oak Harbor’s offense in every way. Meanwhile the 89er offense was focused on using their ground game to move the ball up and down the field. In the red zone, running back Jesse Voss ran in a touchdown to give his team their first lead at 6-0. Later in the game, once again in the red zone, quarterback J.J. Gray scrambled for a touchdown of his own to push their lead to 13-0. The defensive would hold it down from there. Once again holding their opponent to zero points, the Junior Hawks’ record moved to (5-1) with the 13-0 victory. Bryson Fryberg, one the leaders on defense, had several QB pressures and several key tackles during the game. Bryson shared it felt good to hold Oak Harbor scoreless, but that his favorite moments were the hard tackles he dealt out. Later that Saturday, the undefeated Junior Hawks Bantam squad took the field in a matchup with Arlington at Arlington High School. The Bantams are led by a high-octane offense that averages nearly 45 points per game, while their opponents only average a single touchdown. 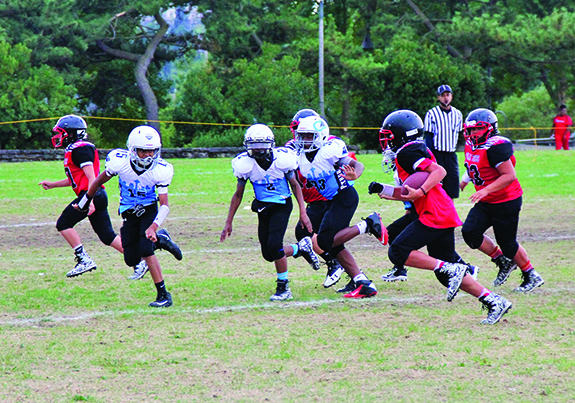 With two more regular season games before playoffs start, both the Junior Hawks Bantam and 89ers teams are playing great football and keeping their eyes on the prize: a Junior Football League Championship. 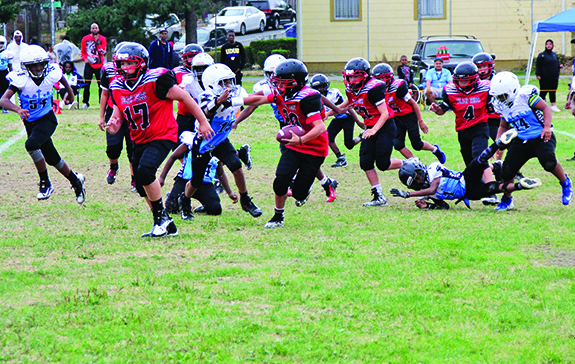 It’s been nearly fourteen years since Tulalip had a youth tackle football program. 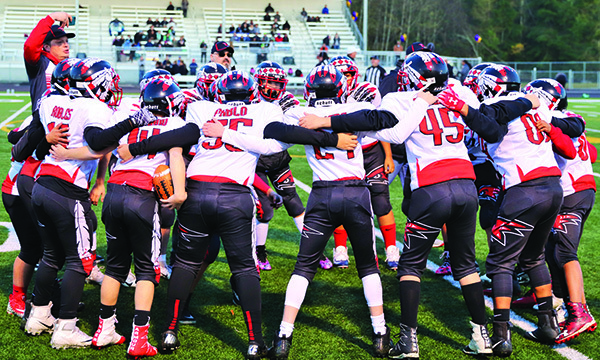 During that time frame any young athlete with a desire to showcase skills on the gridiron has had to play under the Marysville or Everett banner, but not anymore. 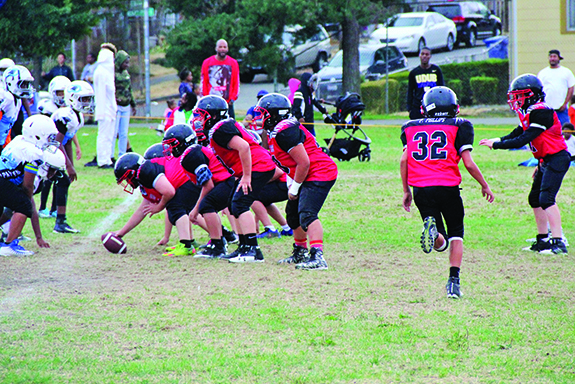 Only a matter of weeks ago Tulalip received the necessary funding and resources to put together its own youth tackle football program. With the careful guidance of Lonnie Enick and Josh Fryberg at the helm, the JR Hawks football team has officially taken flight. Like the Field of Dreams mantra says, ‘If you build it, they will come’. 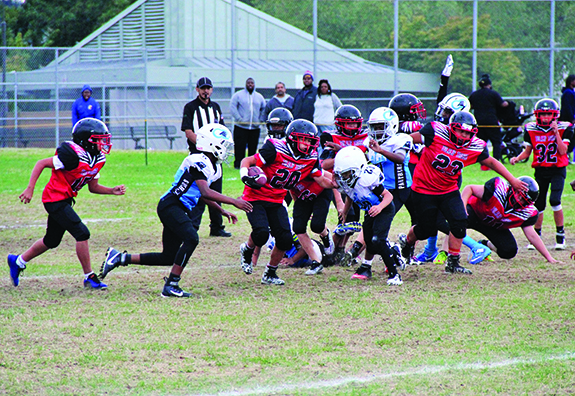 With a brand new football field installed at the Youth Center, all the staff needed was to spread the word about the return of youth tackle football. There was no shortage of eager, young tribal members turning out for a series of practices held in early summer. 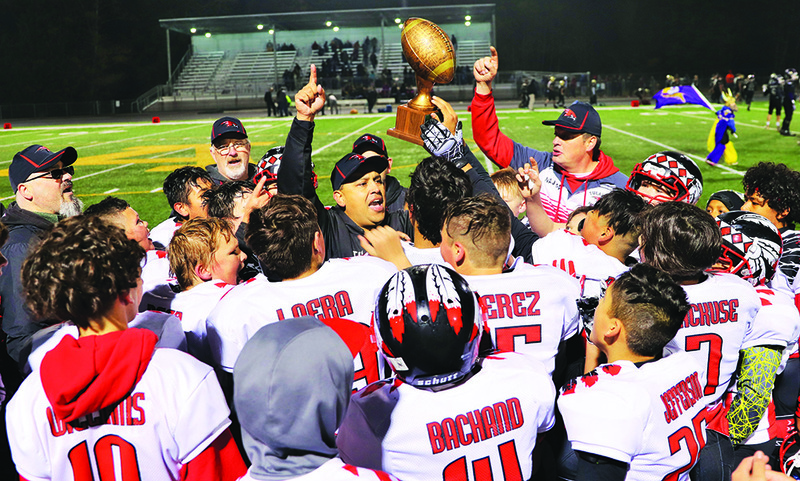 When it was all said and done the latest iteration of the JR Hawks football team consists of 27 players, 25 of them being Tulalip and two other Native (Alaskan and Klamath). Ages range from 9 to 12-years-old. Worth noting is two girls are on the team. Tieriana McLean aka ‘Peanut’ and Jayne Jones aka ‘Icebox’, as their teammates call them, are proving females can thrive in the contact driven sport as well. The head coach is Jeff Rice, longtime President of the Marysville Red Raiders Youth Association. Coach Rice is a big asset to the team not only because he knows a lot about the program, but because he’s very familiar with the traditions and culture of the Tulalip Tribes. His assistant coaches are Willy Wolftail, Izzy Wolftail and Deyamonte Diaz. Each of them are tribal members, former high school football standouts, and well-known personalities within the Tulalip community. Together they form a coaching staff that is knowledgeable and committed to the next generation of athletes. After a series of scrimmages with local teams, the JR Hawks hit the road and journeyed to Judkins Park in Seattle for their first taste of real game action. Their opponent was the JR CD Panthers who ranked number one the last three years in Seattle’s youth premier league. Although the game ended up being lopsided in the JR Panthers favor, it was a good learning experience for the JR Hawks and provided the coaching staff with a list of things to work on going forward. The team plays another away game at Mount Tahoma High School in Tacoma on September 16 before playing a home game on September 23 versus the JR Puyallup Warriors. “It feels great to see a Tulalip Tribes youth football team again,” says Josh Fryberg. “I remember wearing that Tulalip Tribes football jersey when I was a kid. The youth will learn so much about discipline, work ethic, and teamwork from playing football, things that will help them mature into responsible adults. We are proud of all of the players for striving to be successful on and off the field. We look forward to creating great relationship with all organizations for youth football as we support unity and teamwork.